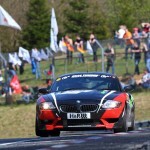 Posted 2012/04/22 by jules & filed under Motorsport, VLN. The races are coming thick and fast. Looking forward to being back in Nurburg on Thursday evening for the next race. Really hoping for a good race, a finish, and improving our lap times. This race is the last before the incomparable 24H – I would expect a full entry list – maybe 200 cars – and some interesting cars and tactics. Yes – 214 cars entered qualifying with 208 posting a time. The race ended slightly early under the red flag – following another great Manthey victory – with just 148 cars. We finished 91st overall and 7th in class V6 of 17 starters and 12 finishers. The weather was stunning – (too) warm and dry. Mark took the start and finish stints with me running in the middle. The suspension was not right – it had been further adjusted but was in fact worse than the race before – some of the hopping experienced (with the stiffer springs) at the season test was back. This made the car lively at the rear (bouncing and hopping) and I found it very unsettling. The car also had an intermittent electrical problem (alternator or battery) during the race – in fact the car died on the last lap – but due to the red flag we were still running when the race finished and so were given a place. Since the race the team have found a specific problem with the suspension and are working hard to get it fully sorted for the 24H. Mark really persevered and given the circumstances posted some good times.